When Avocado Toast became the darling of the food world this past year, I didn’t jump on the bandwagon. 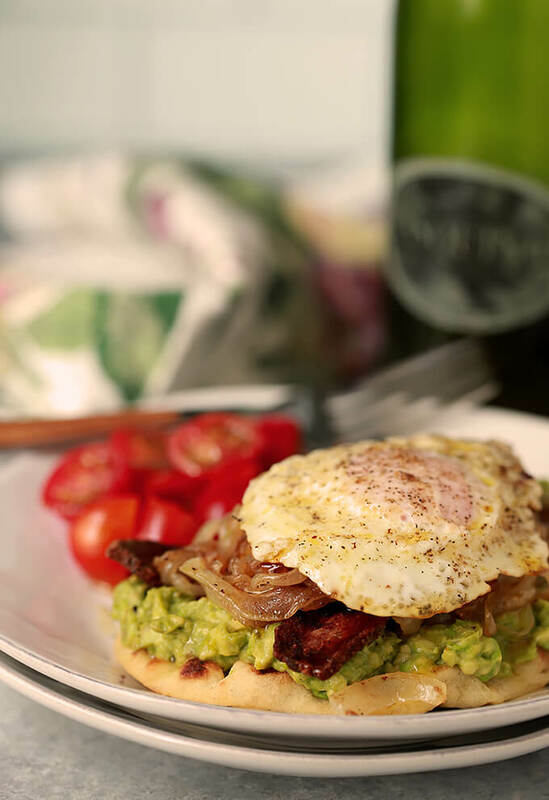 I waited until I was in the mood for something more…and this Avocado Toast with Bacon, Egg & Onion on Naan is it! I had a conversation the other day with a friend about fads. I’m not the type to get onboard with them; if I’m honest I pretty much have an aversion for them. There is such a strong degree of independent spirit in my soul that I’ll be doggone if I’ll do it just because everyone else is! I was recounting to her about the legend that I was often told while growing up about the first full sentence out of my mouth. ‘I do it myself!’ And that hasn’t changed much; I can be so stubbornly independent that anything that smacks of following someone else’s lead is anathema to me. Not always wise maybe but hey, I didn’t have to waste my time on that awful kale did I? So the more I heard ‘Avocado Toast!’ the less I wanted to. I love avocados. I love toast. I eat toast and sliced avocado together sometimes for breakfast but not really ‘together’ if you know what I mean; my avocado is not smushed. So what changed Barb, hmm? What’s with this offering today? Well providence of course. I’ve said it before and it’s true so often that my recipes are often inspired by what I have available in my fridge or pantry and honestly maybe spying some ingredients placed near each other. That’s exactly what happened, again. Bacon nestled right next to a new container of eggs and a gorgeous big avocado that I was putting away after a trip to Sprouts. Hmm…might I actually pull that together in a dish? Then I saw the Naan. I love naan. I have taken to having naan more often with breakfast than bread. I love the texture and the taste and my mind went there…maybe I could try avocado on toast but with a naan twist? I felt a bit like a cheater with this recipe because it’s hardly a real recipe; it’s simply a combination of things I love all stacked together. And then I got over it. Hamburgers are just a combination of ‘stuff’ aren’t they? And hey, I did have to cook onions, bacon and that deliciously drippy egg; whew, I’ll going to try and live with myself after all. So the title says it all. Avocado Toast with Bacon, Egg & Onion on Naan. 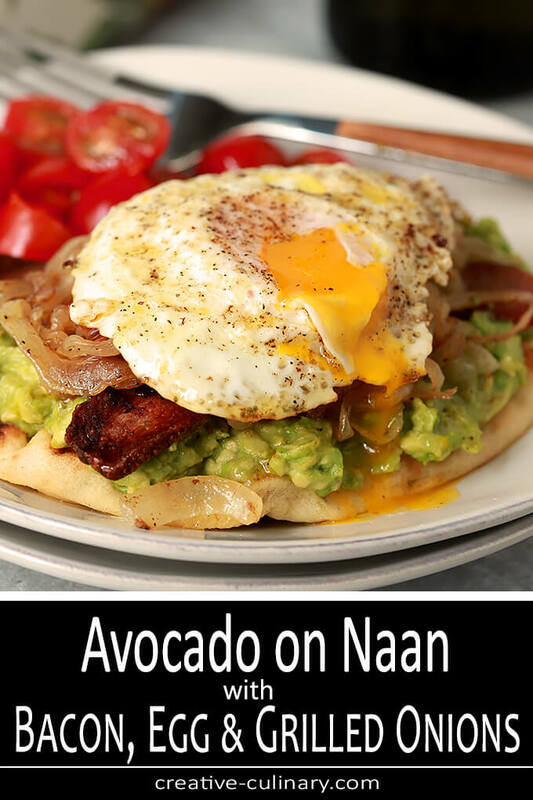 Naan is toasted and topped with smushed avocado lightly seasoned with salt and pepper, then crispy bacon, next some beautiful grilled onions and then the perfect egg. At least for me it’s the perfect egg. If you love your eggs with a firmer cooked center, then do that. My original experience with fried eggs came from my dad; he was always on duty as the breakfast maker. I don’t always do it his way because it requires bacon but on this day I knew that my eggs would depend on my bacon. Our tradition is simple; we fry the bacon in a cast iron skillet first; once it’s done, the bacon is removed to paper towels to drain and the egg frying can begin. I actually love cooking them in a relatively hot skillet to get sort of crispy edges but the most important part is how we finish the top. My dad was never an ‘over easy’ kind of guy; as a matter of fact I don’t recall ever hearing that term as a kid. Nope, he simply fried them hot to crisp the edges and then used a spatula or spoon to pour the bacon fat over the egg yolk. Nothing fancy but there was a method to his madness I think. We had a big family with six kids and with that comes a big family food bill. We all ate our eggs the same way; there was no democracy in our house. Honestly I don’t think he wanted to risk a broken yolk by flipping them so he found his own way to guarantee success. He never had to redo an egg or give it to a dog that I recall…so I’m going with that. I’m pretty certain it was not some amazing technique he gleaned from the food section of the St. Louis Post Dispatch. Nope, I doubt it. My dad wrote Letters to the Editor; was renown for them even, but the food section? Not so much. I simply ladled bacon fat for a minute or so and the yolk was sealed and the egg done. I honestly think I saw a big article in a food resource in the last couple of years about crispy eggs with runny yolks and had to laugh; no that was not new…MY DAD DID THAT! The onions are caramelized before the bacon is cooked so it takes a few minutes (or make them a day ahead). I took that time to prepare the avocado. I kept the avocado very simple but if you want to up the flavor profile, this would be the place. Add garlic or cumin or even some red pepper flakes; make it your own. Once the onions are done, they’re removed to a plate and the bacon is fried next. While the bacon is draining on paper towels the star of the dish is quickly fried. Really pretty easy and lovely that it only requires one pan. I like to warn the naan in the oven for a couple of minutes before putting everything together. Then it’s simple layering and the end result is fantabulous! You know what this reminds me of? Don’t laugh but a fajita. Meat and grilled onions with guacamole in a tortilla…see, very similar. I think better too; did I mention I absolutely love naan bread? I don’t know about you but while this might appear to be a breakfast dish I decided to serve it for dinner the night I made these and not one person put their hand up and said, ‘But Barb, this is breakfast!’ No…they were hungrily devouring my version of Avocado Toast; seems we all loved this stack of deliciousness. Hope you do too! This is my contribution to our monthly group event called Progressive Eats and this month we’re serving “A Spring Eggstravaganza” (cute huh?) Eggs and more eggs so be sure and click on my friends links for more great egg dishes from fabulous cooks. 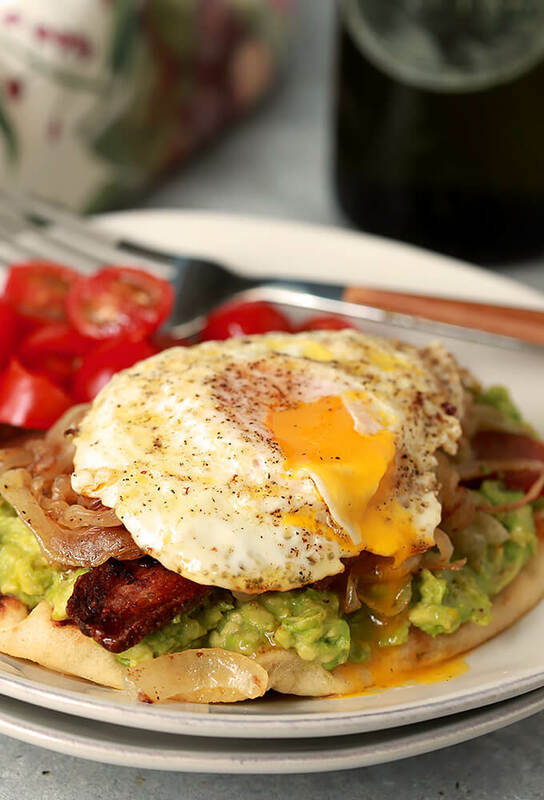 Layer naan, avocado, bacon, grilled onions, and a fried egg for a fabulous breakfast or Brinner (breakfast for dinner). Melt the olive oil and butter in a large skillet. Add the onion, salt and pepper it moderately, and cook on medium heat for about 15-20 minutes until softened and starting to turn brown. 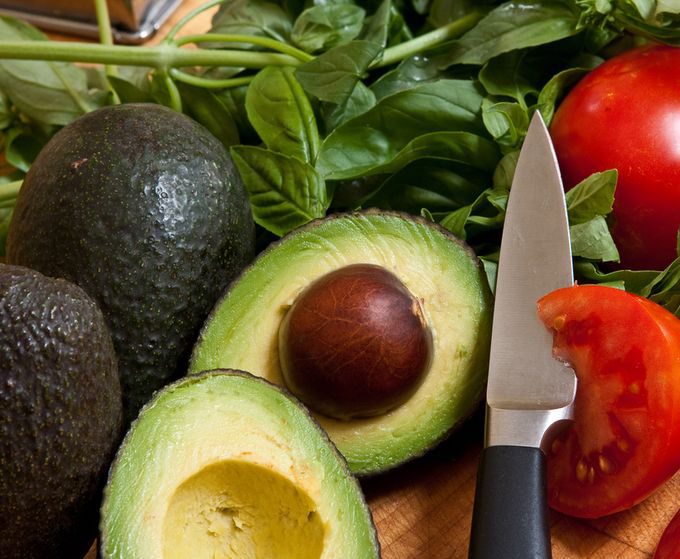 While the onions are cooking, prepare the avocado. Remove the peel and the seed and mash the avocado on a plate; seasoning with lemon juice, salt, and pepper. Add additional seasonings of your choice if desired. Once the onions are done, remove from skillet to a plate, and set aside. Add the bacon to the skillet and fry on medium heat until brown and just turning crisp; remove from the pan and let drain on paper towels. Put the naan into a toaster or toaster oven and heat until just warm. Turn up the heat to medium high and crack the two eggs into some of the bacon fat in the skillet (If you don't have much fat, add a bit of butter to the skillet). Cook the eggs until the white looks done and the edges start to crisp slightly. Using a spatula and a scooping motion or a large spoon, drizzle bacon fat over the egg yolk until it turns opaque; sprinkle with salt and pepper. Arrange the dish in layers. I confess I hop onto trends – I hope we can still be friends. To clarify, I don’t do trends just because everyone else is, but I do join the crowd on something I like. I LOVE kale, so that trend was just fine with me and I was totally part of the wave. And I still eat it, even though it’s so yesterday now. I used to threaten one of my grandsons with making him a kale smoothie, lol. But avocado toast is just a genius simple dish. I live on the edge and flip my eggs, but I do want to try your dad’s way next time. Your photo makes me want to make this right now, so that might be today!! I love your spin on this Barb and your tenacity to not fall prey to what’s trending. The naan is such a creative bottom for this wonderful mix of toppings. Love putting together these kinds of dishes. I actually rebel against trends… I’m ornery that way! However, I do have a love affair with avocado, and I live on the border in south Texas and they’re plentiful and cheap year ’round. I confess to doing avocado toast with a fried egg and furikake somewhat regularly. Because it’s good! I think your version “kicks it up a notch!” Delicious! This looks positively amazing and I’m right there with you on trends! I love that you used naan. We always have whole grain naan in our freezer in case we get the urge for a quick pizza–it’s so versatile. The bacon and fried onion are playing my song! Thinking I’ll add some fresh tomato slices, too! So, before avocado toast was, well, avocado toast, my kids and I ate it frequently — often with an egg over easy on top. Sometimes cheese too. But I love that you’ve added bacon and those caramelized onions to this. I also really love that you made it on naan. We don’t eat nearly enough naan. Thank you so much for inviting me to Progressive Eats! I am so excited to be part of the group. I will plead guilty to loving avocado during its “in” phase, but I loved it before and will love it long after the trend is over (has that happened yet? ), so I consider myself safe as a non-trendy food lovers. Unfortunately for me, my dad never made me breakfast – eggs or anything else. I learned to love runny yolks from breakfast in diners. Now that you’ve taught me the trick with bacon fat, I may have to grab a couple of eggs and have breakfast for dinner! Oops – no bacon in the house. Well, there is always the weekend. I grew up cooking eggs the way your dad did and enjoyed the crispy edges so much. These ingredients combined together make for a beautiful breakfast, delicious and healthy! My dad did that with eggs too! That’s how I learned to cook fried eggs! Your breakfast looks delicious. I’m sure you’ll start a new trend. I didn’t catch on the avocado toast “trend” . But this is one avocado toast I will actually get behind ! Great idea to put it on Naan. the flavors just work together and textures are so varied! Love this idea. I was late to the avocado toast trend myself, but now I need to kick mine up a notch or two! Your version looks fantastic, Barb! Thanks Liz…it’s a bit decadent and was SO delicious.